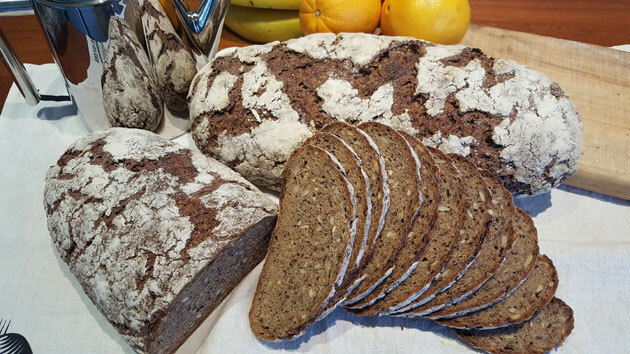 Learn how to make this gorgeous rye sourdough bread with a complex flavour, aroma and moist crumb. Very popular as the grain flavours are very apparent in this bread. This recipe uses 25% rye flour (only the endosperm of the rye berry) and 20% rye meal (the entire rye berry) and only 20% bakers flour. The soaker includes kibbled or cracked wheat, kibbled rye, sunflower kernels and linseeds. Rye flour is a good one to try if you have issues with bloating as it includes only small amounts of gluten. To create this bread you first create a soaker and then 12 hours later create the sourdough using a starter. If you don’t have a starter you can create one using this page. 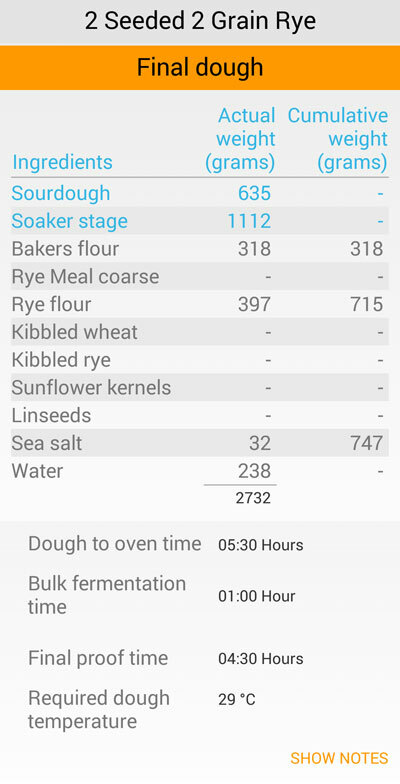 Essentially the sourdough stage is a method to increase your starter from its original amount to the amount needed to successfully leaven your bread dough. Additionally there needs to be enough sourdough created to allow you to remove the amount added as starter – effectively cycling your starter as well as making bread. The final stage is the bread dough itself. This stage does not need a huge amount of kneading for gluten development as rye does not have alot of gluten and there is only 20% bakers flour included. Be aware that extra water may need to be added if the dough becomes too tight. 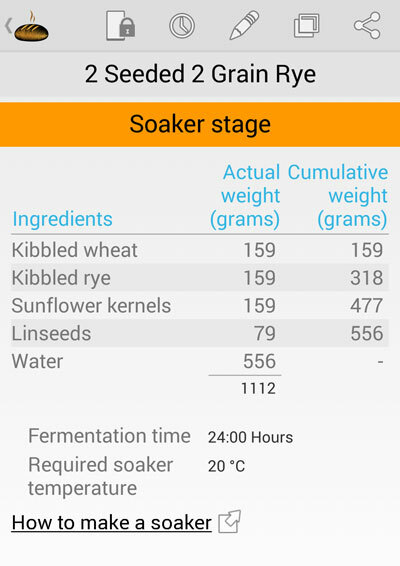 Flour’s water absorption can be variable so just ensure that the bread dough has a moist and light feel to it. To the uninitiated there is a tendency to err on the side of making the dough too tight – insufficient water – but with rye being a sticky dough due to its pentosan content this tendency is even greater. But rest assured rye needs even more water to be optimum. So err on the side of a soft dough and you’ll have better results. This recipe requires a very high dough temperature for the final dough of 29°C (84°F), we used a method outlined in this post to make sure the water was 64°C (147°F) . How to make a soaker. 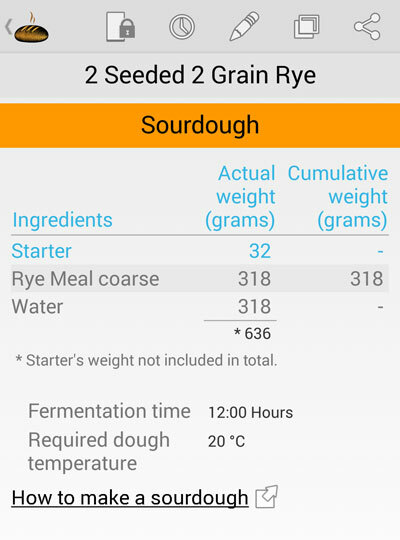 The sourdough created in this stage will be 32g more than is required in the bread dough. This amount will be removed from the sourdough stage before adding it to the bread dough and will be your starter for the next time you bake. Baking Temperature and Time Set oven to the hottest is can go, at least 250°C (482°F) and bake for 10 mins at this temp and then turn down to 200°C (392°F) and bake for a further 45 mins. The video gives you a good idea of how to mix the final dough, mold and add to the basket and bake off. Weigh and add bakers flour and rye flour to mixing bowl. Weigh water, ensuring it is quite warm and add to the bowl. Mix ingredients together with your hand and add more water if necessary to achieve a soft dough. Tip onto bench and knead gently for a few minutes. Place dough back in to the container and cover for the bulk fermentation time. Dust bench with a generous amount of flour and scale dough into individual loaf sizes and mold into the bread shape with the seam up. Gently place loaf seam down into banneton lined with a tea towel and a generous coating of flour. Coat the loaf with flour to achieve the cracking contast. Leave uncovered to ferment for the final proof time. Preheat oven to the hottest it will go for example 270°C (518°F) and bake for 8 mins at this temp and then turn down to 200°C (392°F) for 45 minutes. Tip: Once the bread has been baked and cooled down, place it in a plastic bag overnight so that the moisture spreads throughout the crust and is easier to cut the next day. Sunday 3pm Place the first loaf in the oven at the high temperature for 10 mins and then turn it down to 200°C (392°F) for 45 mins. Kibbled just means that the whole grain berry has been cracked. The grain has been put through a kibbling machine which is really just a set of two drum rollers with steel fingers that radiate from the drum and mesh together as the drums roll round. As the grain passes through the fingers while they move the grain gets cracked. We use kibble grain as it has better water absorption and the endosperm (the inside white part of the grain where white flour is extracted from) is partly exposed and it allows better baking and gelatinisation of the starch. I liked the video and learned a lot from watching. How do you judge when the kneading phase is complete for rye breads. I usually use a stand mixer and I think I have been “creaming” the dough. That’s a good question. Let me just first say that in general the total amount of wheat flour has a bearing on this. The general rule is that the less wheat flour content the less mixing/kneading is needed. This is due to kibbled grains or seeds not contributing to the gluten content and other flours other than wheat – such as rye not containing insoluble glutenins – the elastic protein naturally in wheat flour. This is an experience thing that is subtle and must be assessed visually and by touch. Since every mixer has a slightly different energy input or mixing action, giving you a mixing time is meaningless. I my experience with this type of dough, if it’s smooth and is able to be plastic with some “body” it should be fine. By body I mean keeps together and has some resistance when squeezed. Conversely, you know you’ve gone too far or “creamed” this type of dough if it changes to a cream consistency – excessively sticky with no body. It also takes on a lighter colour and becomes excessively shiny or glossy. This will result in a flat loaf with poor keeping qualities. For this type of bread dough, of course, err on the side of less mixing since it only contains 20% wheat flour.